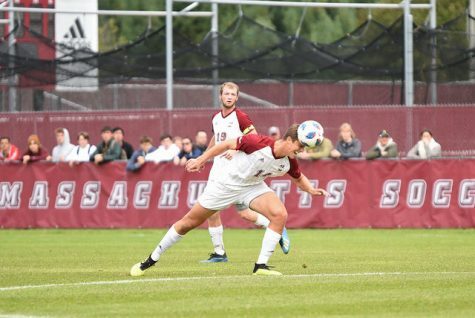 In the 90th minute of a 2-2 match, Mark Morris was handed an opportunity to give the Massachusetts soccer team a key victory over conference rival Rhode Island. With time winding down, freshman forward Samuel Asamoah came streaking across the box, chasing down a loose ball and colliding aggressively with Rams goalkeeper Nils Leifhelm, tumbling harshly onto the turf at Rudd Field. Asamoah looked up, a little shaken from the collision, and found out that he had been rewarded for his effort with a penalty kick call. 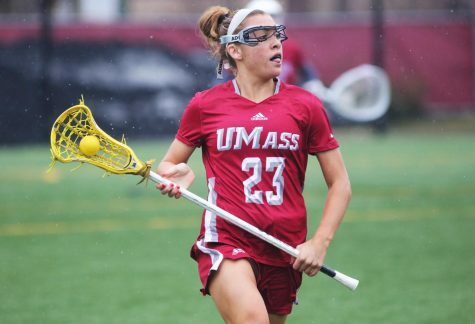 Morris, who had provided both goals for the Minutemen up to that point, was then presented the chance to secure a hat trick, and UMass’ second victory of the year. Morris’ ensuing shot was then saved by Leifhelm, but it deflected right back to him to slot it home easily to take the 3-2 lead. 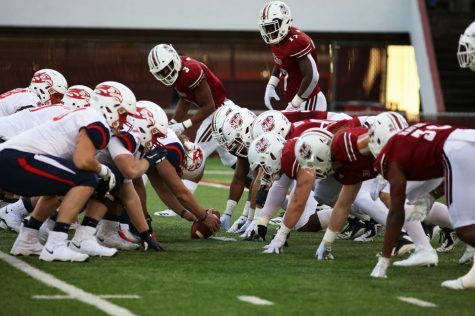 Offense had been a weak point for the Minutemen this season, as UMass scored just a total of five goals in the 11 matches prior to its three -goal outburst Wednesday. 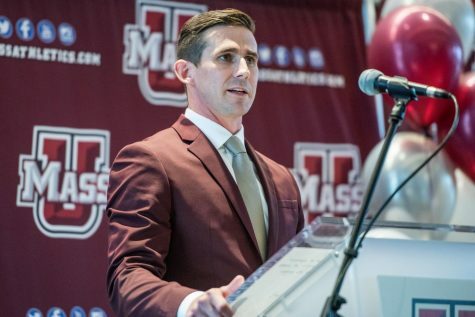 UMass coach Fran O’Leary said he was pleased to see his team finally capitalize on the opportunities it’s been able to create. 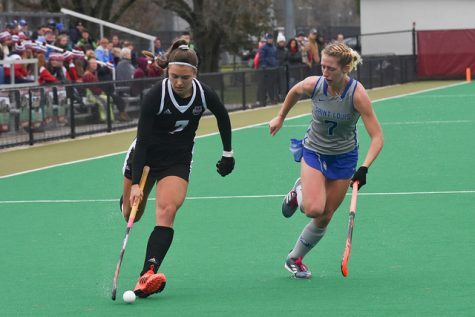 The victory comes on the heels of a 2-0 loss to Saint Joseph’s in its previous game, but with the most recent win, UMass now boasts a .500 record in conference play. From the opening kickoff, it looked like the Minutemen would struggle against the Rams, who are the defending conference champions. Maintaining their composure after going down 1-0 in the 24th minute, UMass hung around, creating chances of their own, but to no avail as the Rams defense remained stout. UMass then came alive in the second half, scoring in the 53rd minute on Morris’ first of three goals on the day to tie the game at one apiece. O’Leary said he was not concerned with going down early in Wednesday’s game, and he praised the Minutemen’s efforts in fighting back. “We were resilient, we fought back, and it’s a huge character win against a very good Rhode Island side,” he said. 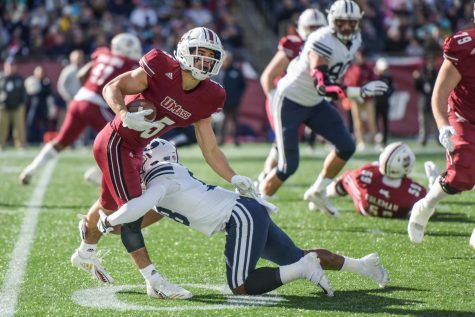 Whether it was offensively or defensively, Ty Goncalves proved to be a major impact all over the field, assisting on the first two UMass goals. In the 66th minute, he chased down a ball that would have gone out of bounds, but with creative footwork, he managed to keep it in play and floated in a cross from the wide right flank that Morris got his head on to sneak it in for a 2-1 lead. 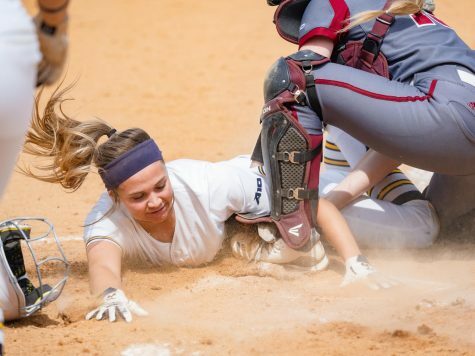 “I was just hoping I was going to keep it in, and I did. I saw someone at the back post and hit it, and Morris had a great header. It was awesome,” Goncalves said. Holding a 2-1 advantage with time winding down an unlucky bounce set up URI with a late corner kick, and after making the initial clear, the ball deflected out to Rams midfielder Dominik Richter, who hit one right underneath the crossbar to tie the game at 2 in the 75th minute. “They score what I call a worldly goal a fantastic goal out of the blue,” O’Leary said. 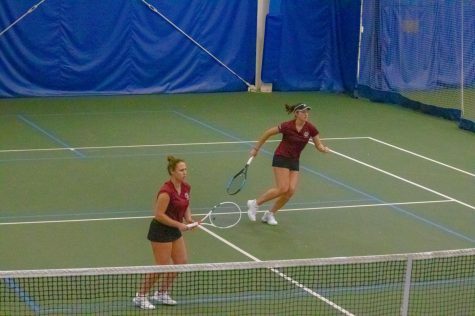 Despite losing its lead, UMass continued to battle late into the match. “We didn’t let it knock our confidence. We just kept going and we got our rewards in the end,” O’Leary said. 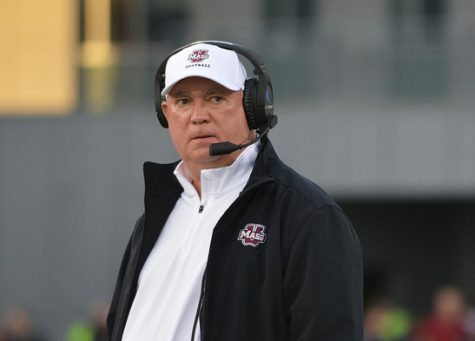 With conference play in full swing, O’Leary said this victory gives them a huge lift. 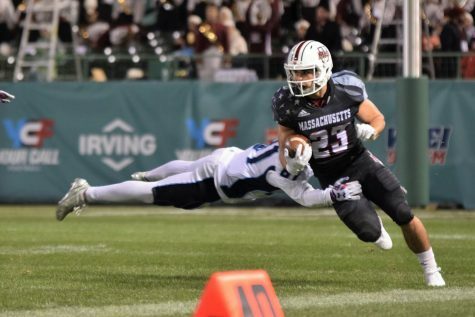 The Minutemen will look to keep its momentum going this Saturday at Rudd Field against No. 18 Saint Louis, with kickoff set for 1 p.m.